Nobody likes to live in a crowded home, but our luxury apartment studios at Alexan on 8th are far from packed. Each studio floor plan features more than enough space for single residents to live comfortably – from the new citizens acclimating themselves to Atlanta, to those who simply enjoy a simple, beautiful home close to the historically rich city. Best of all, our studios feature the same amenities as all our other luxury apartments, meaning you supreme comfort at a reduced price. 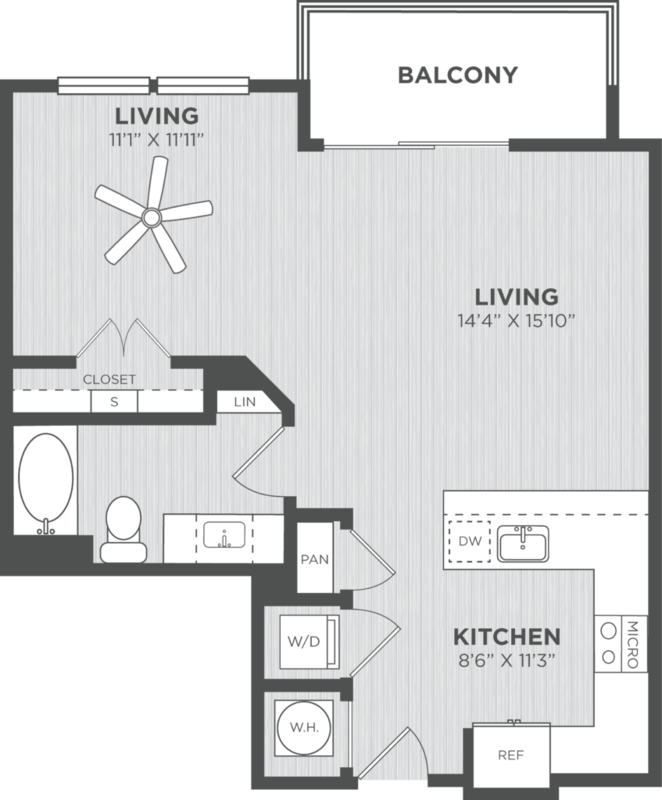 One of our luxury studio apartment floor plans, the Boiler, balances versatility and comfort within its roomy 671 square feet of living space. The gigantic living room has two different sections, allowing you to arrange your home however you like: you can place your bed beside the large double door closet and separate it with a privacy wall or curtain, put your TV and couch close to the kitchen to share snacks and games with your friends, or mix the two concepts together for a truly unique living space. The open-concept kitchen includes ample cabinet and pantry space, along with a raised breakfast bar for easy serving. Refresh your body and mind in the deluxe bathroom, complete with a linen closet and a large soaking tub. Take care of laundry from home using the standing washer and dryer set connection across from the kitchen. Finally, step out and admire the lovely community views from the private balcony. Find a beautiful studio apartment that doesn’t sacrifice space at Alexan on 8th. Schedule a tour of The Boiler and our amazing luxury apartments in Atlanta today.